My relationship with Durarara!! is what you might call rocky, a rollercoaster of emotions. If we were still sticking to the sandwich metaphor, I’d probably say that I wanted to send it back, but then I had a good bite and decided to keep it, but then I had another bad bite and I wanted to send it back again, but ultimately I decided to keep on truckin’. 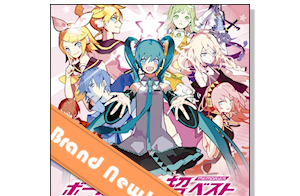 There are so many things about this series that could be so good if they weren’t so…bad. We pick up where we left off: Kida is having a sit-down with Kadota and his little group. He knows they’re aligned with the Dollars and they know he’s the leader of the Yellow Scarves and it’s not much of a stretch for a genius like Kadota to figure out that he wants to talk about the recent Slasher violence. Right away Kadota says that he doesn’t think the Dollars are involved – he’s sure he’d know if they were, and besides some Dollars members have also been attacked – but Kida thinks maybe it’s an elaborate trick, like a subsect of the Dollars are acting independently and even targeting fellow Dollars members to make it look like an outside job. Gangs are so complicated. There’s also a strange little portion of the conversation in which the Blue Squares are mentioned. It’s possible I got a bad translation of the scene, or it’s equally possible that it’s just poorly written to begin with, but all the characters try hard to speak in riddles and metaphors and it comes off as extremely convoluted and dumb. What it sounds like is Kida thinks some of the old Blue Squares members who have joined up with the Dollars are the ones causing trouble – but remember: most, if not all, of the Blue Squares merged with the Yellow Scarves during his absense. Kida still doesn’t know that, though, and they don’t tell him. Instead, Kadota and friends have a very strong reaction to this and take a long time making veiled and not-so-veiled threats about the danger of pursuing that line of questioning. As they’re all talking, we get intermittent narration from Erika about the importance of fiction vs. reality – essentially, creating a fictional world for yourself (in which you live vicariously through anime, or pretend you never set a bunch of people on fire when you were a member of a particular violent gang, which you won’t admit exists in the first place) in order to keep your reality from being too much to bear. To varying degrees, we all employ coping mechanisms like that, though in this scene it all comes off as pretty silly. 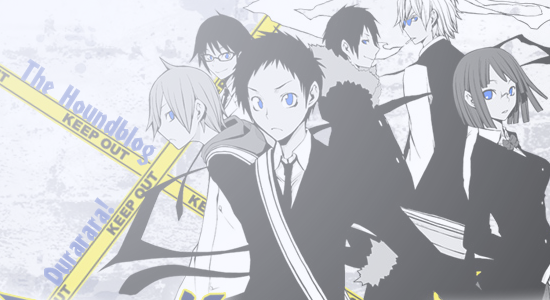 And, again, here’s Durarara!! reminding us that “reality” might not be totally “real”…as if we were ever allowed to forget. Anyway. Kadota goes on to say that he doesn’t trust Kida’s ability to control the thugs in his gang – which is a fair assessment, I’d say. He’s about to lecture Kida about using the gang to solve his own issues (uh…isn’t that a perk of being a gang boss? ), but Kida admits that that’s what he’s trying to do before the tongue-lashing begins. Kadota agrees to give Kida the number of a person who can set up a meeting between him and the Dollars’ leader (guess who! 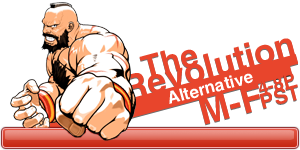 ), but also warns that if Kida persists in believing that the Dollars are his enemies he’s going to have to prepare for a fight. Like, a big one. A really big one. Huge. After they all leave, Kadota and friends chatter a bit about how Simon might be really (of course we’re all curious, but I have a feeling we’re not going to find out). Kadota is stuck on the name of a Yellow Scarves member: Horata. Kida claims the guy was a victim of an attack by the headless biker. I don’t remember this guy, I don’t know if I’m supposed to, but it seems to have struck a chord with Kadota. We’ll see. Kida is shocked (shocked!) 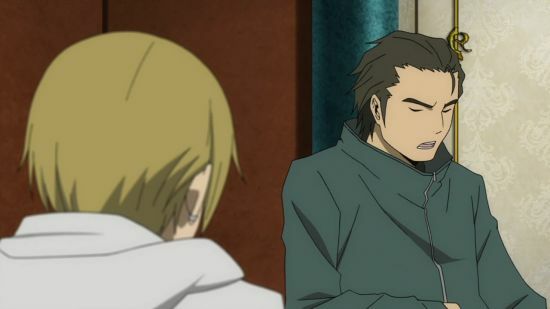 to find that the person Kadota told him to contact is Izaya (shocking! ), but goes to meet up with him anyway. 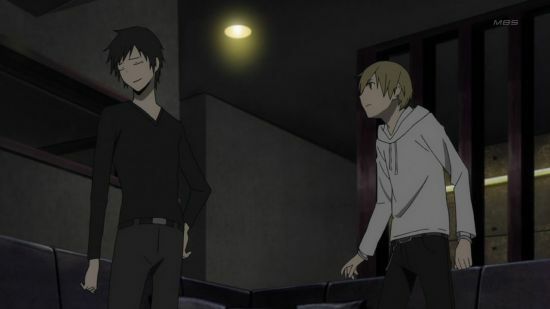 Izaya, always ten steps ahead of the game, not only expects him to call but knows what he wants to talk about. Where does this guy hide his crystal ball? I know it’s not in his pocket, his pants are too tight for that. Izaya dances around the subject for awhile, drawing out the frustration for Kida (which I find most shockworthy!). He talks about all kinds of things, including Kida’s relationship with Saki and how it wasn’t as important as Kida thought because he wasn’t able to save her, but he’s trying to make up for it by “saving” Sonohara from the Slasher. 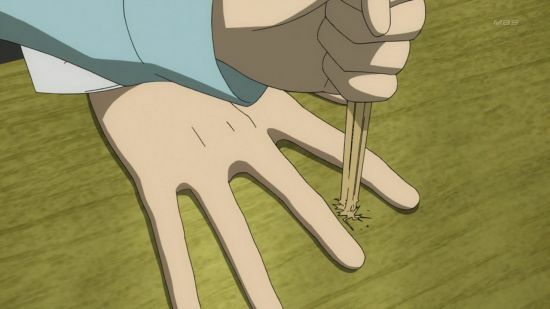 Then he brings up Mikado and Kida is all, “whatever, he’s not related,” and Izaya has his “OH ISN’T HE?? ?” moment and then all is revealed. Poor Kida. 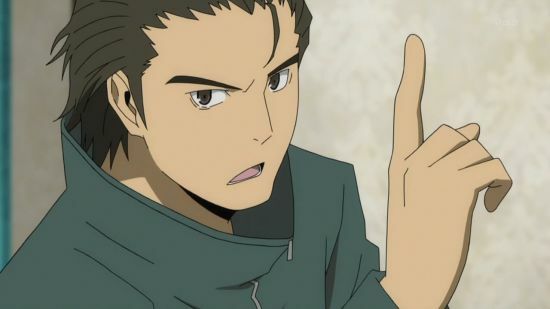 Not only does he find out that his best friend is the leader of the rival gang (the one he thinks is responsible for unleashing a slash-happy demon on his community and injuring his friend), but Izaya frames it all in such a way that Kida believes Mikado isn’t really his friend and also knows about his (Kida’s) involvement with the Yellow Scarves and is pretty much laughing in his big dumb face. I am shocked beyond compare that Izaya would even go there. Shocked, I say! 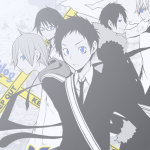 Izaya also goes on to stir up trouble in the chat sessions by claiming that the Dollars (allied with the black biker and the Slasher) attacked the Yellow Scarves’ super secret hideout – which comes as a surprise to Mikado, who’s their leader, and Selty, who was there. They deny it, and when Sonohara bumbles in they execute a quick change of subject. Afraid she’ll give something away? Afraid she’s too sensitive? Afraid she’ll go bonkers and start with the slashing again? I don’t know. I don’t even think Mikado realizes that chat-Saika = Sonohara, so why would he care about protecting her? At school the next day, Kida second-guesses everything Mikado does and tries to dodge him at the end of the day. 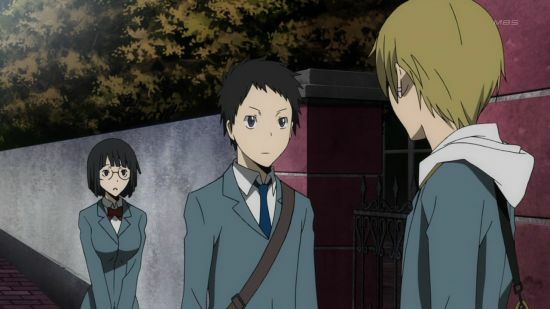 As far as we know, Mikado doesn’t know about Kida, but it’s possible that we just don’t know that he knows yet (that’s so Durarara!!). A Random Friend from school (who’s appeared briefly before once or twice, but who we have no reason to care about) pops in, anxious that someone may have spilled that he’s a member of the Dollars. Kida and Mikado both deny that they told anyone, but Random Friend gets a pretty savage beating from the Yellow Scarves later (have you remembered to remember that the mean, violent ones are Blue Square cast-offs?). When we see Kida and Mikado again, Kida’s just found out that Random Friend is in the hospital and is off to visit him. And then the episode ends – stupidly, awkwardly, without much of a cliff-hanger. Sure, the result is that Kida is realizing that his gang is out of control, but we already knew that and Random Friend’s beating is all but meaningless to us because he’s barely more than a face in the background. The final scene leaves me with a feeling of, “so what?” Durarara! !, let’s skip all this nonsense and move on to something that matters. 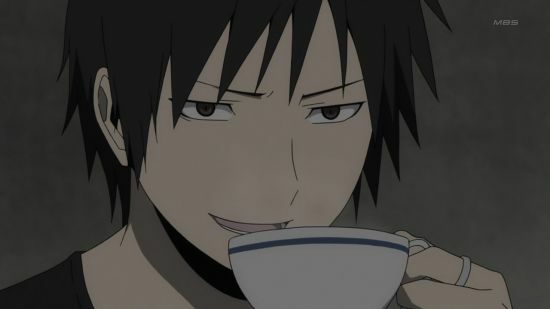 Do you suppose Izaya is a latte or mocha kind of guy? Maybe tea? I have to admit… I’m rooting for Izaya just a bit. I feel many of his plans have too many weak points and he plays around too much due to his confidence, so I’d like to see him backed into a corner for once, but really… How many people can turn a city and it’s people into a giant chessboard?